On Friday as usual Family Search updated their list of new records. As normal I took a look at the records see if there were any Lefever’s contained in the new recordsets. One of the new recordsets was Utah, Pioneers and Prominent Men of Utah, 1847-1868 on searching this set I found a ‘lost’ Lefever from Crowland in Lincolnshire. 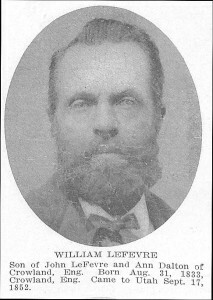 I already knew about William Lefevre, the son of John Lefevre and Ann Dalton, born in Crowland, Lincolnshire on 31st August 1833. His existence is mentioned on his father John’s memorial in Liverpool. This record on Family Search also includes the photograph of William on the left side of this post. William’s life, from what I have been able to piece together was both challenging and tragic. On 29th January 1849 aged 16 he emigrated from the UK to the USA, whist aboard ship in Liverpool waiting for a break in the weather his father John was taken ill and died on 26th January and was buried in Liverpool on the 29th, the day that the ship Zetland finally left Liverpool. The Zetland arrived in New Orleans on 1st April 1849 where William, his recently widowed mother Ann and sister Sarah and nephew Tom took passage on the steamship Iowa to St Louis where they arrived on 13th April. The story of the voyage is documented on the Mormon Migration website. The family were all present in St Louis during the cholera outbreak in the summer of 1849. His nephew, sister and mother were all victims of the outbreak unfortunately Sarah did not recover and was one of the 4,500+ victims in a city of around 75,000. So far I have found that William married Hannah and dies on 3rd March 1920 in Panquitch, Garfield, Utah, USA. I have yet to find any more of William’s life story, how he went from St Louis to Utah and how he became a pioneer of that state. So I still have plenty of research to do about him.